You will get 3 more ebooks FREE Luck Maker , Dream Seal and Swamirakle with this. When I read the very first release manuscript ( Karma Deck ) by the Unknown Mentalist, I was entranced. His knowledge, insight, effects and their methodology were first rate. Beginners luck, I thought. And then I read more of his subsequent releases, it was terrific. Can one man really be putting out this much quality material? I was almost shaken. And now the swami gimmick, my bread and butter......I hope the Unknown Mentalist asks me to collaborate on a swami effect or two. I respect his one of a kind thinking. Just try to imagine this. Although this may very well be beyond imagination. Tony Corinda, David Berglas, Max Maven and Kenton Knepper have gathered around a table (what ?). These "Mind Giants" are discussing magic and mentalism (what else?). And huddled up in a corner on the floor is a young kid who is intently watching them, observing them, listening to them, learning from them, absorbing their ideas and digesting their concepts. Further, presume that, after many many years, that kid who has now grown into an absolutely unknown mentalist, puts together some mentalism routines and sends them to Marc Salem, as a mark of his enormous respect and admiration for him. And the great Marc Salem says "WOW". Can you believe this? Well, the last part is literally true and the first part is figuratively true. This is advanced mentalism and may not yet be for rank beginners. The Unswami is a much overlooked and neglected version of the Swami gimmick which can in fact be much more powerful and far more flexible in application. This ebook gives a complete overview of The Unswami gimmick, other key components, process, psychology, subtleties, etc. This is no longer a mere gimmick but an entire system - The Unswami Principle. Some indicative images are provided for easier understanding. Review on Ningthing by Michael Siegel. Swamirakle is a small collection of ideas and suggestions which can be explored with the Unswami Principle. These are some thought seeds which you can use to further develop routines as per your specific requirements. Luck Maker is a blockbuster routine using the Unswami Principle. Performer openly places a verified sealed envelope as a prediction on the table right in the beginning. A participant chooses any playing card and that's exactly what comes out of the envelope, with a twist. Totally 3 killer versions of Luck Maker are explained. An interesting version of equivoque called Skyvoque is explained. This novel take on the magician's choice will play beautifully for 4-6 objects and can be applied in multiple situations. A highly captivating theme and presentation about a mysterious luck maker is explained. Although quite easy method wise, some presentational skills will help. This is advanced mentalism and may not yet be for rank beginners. No stooges. No pre show. No electronics. Dream Seal is yet another blockbuster routine based on an ACAAN type of plot. 3 sealed envelopes are in play and from the audience point of view a totally hands off mind boggling miracle. Impossible gets a new meaning in this routine. In addition to the main routine, 3 alternative routines, 3 bonus routines and a special bonus routine are explained. A dream sequence theme and presentation are explained. The methods explained are quite easy. But some presentation skills will obviously help. This is advanced mentalism and may not yet be for rank beginners. Includes some convenient optional printable props. 1st edition 2016, 76 pages. Recipe for mentalism ebook success: take one forgotten tool out of mothballs, explain its uses comprehensively well, add some nice routines, and add a few variations on those nice routines. Voila! Great ebook, an essential primer really for this gimmick. The unswami or stylus writer--no, I'm not giving things away here since it's already been mentioned in one of the headliner reviews--was completely forgotten by most...until now. (It's mentioned in Corinda, but then again, so many people don't want to read Corinda because "it's outdated." Right. Keep up that thinking. The Unknown Mentalist and I will run rings around your mentalism with all the "out-dated" stuff that we read in Corinda.) I can't hype this book enough. If you use a swami gimmick--and even if you have Corinda memorized and are familiar with how this all works--you'll need this package set. Your swami may be weapon #1 and the unswami #2 or vice versa. Both have their pros and cons but can be equally effective. Now not everyone uses or even likes swamis. They take practice and a large amount of absolute confidence in presentation. 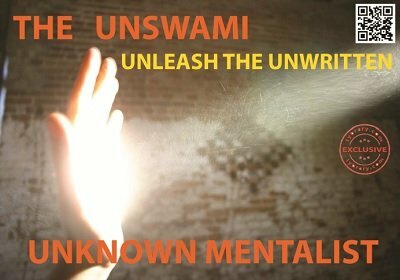 If you are a swami-addict, however, then take the plunge and go in--or "un"--on the unswami. How on earth can anyone come up with absolute stunners like these? Only a devious mind can create these unheard of usage of old classic tools. I heartily appreciate the author for his highly inspired thinking. A bigger name tag would have priced this at least 3 times higher. A big thumbs up! This is top notch stuff. Amazing ideas. Killer routines. Eagerly looking forward to performing them. Some great thinking this. No wonder Marc Salem and Richard Osterlind are so impressed. Yet very much in the range of basic skill level. And man, the special price is a real deal !!! The author sent me this 4 ebook bundle (The Unswami, Luck Maker, Dream Seal & Swamirakle) for review. And I tried to do a fairly detailed review. The basic concepts and tools are nothing new. However, the treatment and applications are quite revolutionary. The Unswami Principle (as the author calls it) is an old almost forgotten concept which has now been brought into the lime light with this release. Although I myself have been using the swami gimmick for over a decade now, I was very much fascinated to know about the Unswami in this manuscript and felt that I missed something so powerful all these years. Unswami opens up a completely novel path. Luck Maker is a fantastic prediction routine using the Unswami Principle. This seems to be the author's take on Kenton's Kolossal Killer principle. But here KK is put on steriods, no wait, something more powerful, say rocket fuel. Luck Maker totally zapped me. There are 3 versions of Luck Maker here - 2 with the Unswami and 1 with the regular Swami. Quite clever and very practical. Dream Seal is an interesting and refreshing routine which resembles an acaan plot though not strictly acaan. Good scope for audience participation. Builds up a stunning climax. It uses a stacked deck in combo with the Unswami principle. Very ingenious thinking and routining here. And the best part is the performer need not know the stack. Although many variations and bonus routines are provided my favorite is the special bonus routine along with the main one - true powerhorses. Swamirakle is a little collection of ideas, not full routines. But some clever ideas which the performer can build on in different ways. These ideas apply to the regular Swami gimmick as much as the Unswami. Overall, there is so much new, unconventional and yet extremely practical, usable thinking that went in here. It stimulated my mind into many new ideas and directions. A 'must have' for any mentalist - amateur or pro.